If you like clubs with tradition, Newcastle United has it in spades. Since their foundation in 1892, they have won four League titles and six FA Cups, which makes them the ninth most successful English club of all time. In addition to that, they have spent an impressive 86 seasons in the top-flight. Their long-standing rivalry with Sunderland, colloquially known as the Tyne-Wear derby, is one of the fiercest local derbies in English football. 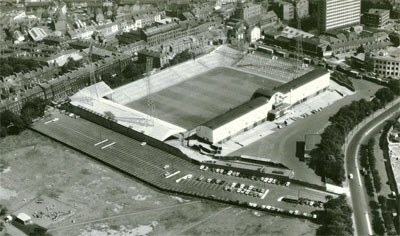 St. James' Park in 1963. The club was formed through a merger of two older Tyneside clubs: Newcastle East End and Newcastle West End. In order to signify the fusion, the newly formed club was named Newcastle United. Not long after that, Newcastle became known for their quick and attractive brand of football which paid dividends during their early years. After being admitted to the Football League in 1894, they earned promotion to the First Division in 1899. They would play at St. James' Park, the oldest football ground i England, there matches were played already in the 1880s. The arrival of a new century proved to be a good omen for Newcastle. With a team full of English stars and international talent, Newcastle went on to dominate the First Division by winning the titles in 1905, 1907 and 1908. Strangely enough, this productive period also contained the lowest point in their history: a 9-1 drubbing to Sunderland in 1908. After claiming their first FA Cup trophy with a victory over Barnsley in the final, their promising run was cut short by the World War I.
Post-war, the club returned in style with another FA Cup trophy in 1924. They followed it up by acquiring the talented Hughie Gallacher the following season; this would prove to be a shrewd business move, as Gallacher became the club's captain and led the team to another League title in 1927. Newcastle won another FA Cup in 1932 before entering a mediocre period that would culminate in their relegation to the Second Division in 1934. Once again, the club bounced back after the war. Led by a future club legend Jackie Milburn, Newcastle returned to the top-flight in 1948 and won three FA Cups in the period between 1951 and 1955, in a streak that would earn them a reputation as Cup specialists. Even though the following couple of decades would see Newcastle making deep runs in both English Cups, additional silverware was hard to come by. In the early 90s, the club turned a new page by appointing Kevin Keegan as manager. The change of personnel immediately yielded results, as Newcastle stormed back to the top-flight in 1993. After hitting the jackpot with big-name signings such as David Ginola and Alan Shearer, Newcastle almost ended up overthrowing Manchester United in 1996 and 1997, finishing as runners-up in both occasions. They also lost the FA Cup finals in 1998 and 1999 before returning to relative obscurity at the turn of the century. In the 1990s until the year 2000 majors overhaul of the classic stadium was done. By several rebuildings the capacity was increased dramatically and a cantilever roof, the biggest in Europe, was created. 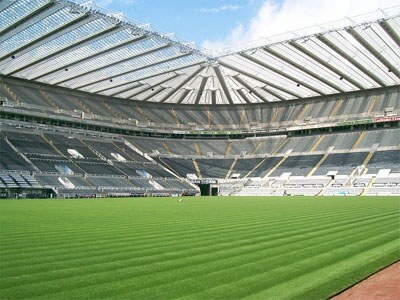 St. James' Park after rebuilding with cantilever roof. The current logo wasn’t introduced until the 1988-1989 season. The logo is based on the Newcastle upon Tyne city crest, but using the black and white team colors. In the blue banner at the bottom, the name of the team is written.